A children’s entertainer has been left devastated after record takings were stolen from a desk. David Stancombe - better known as Dave the Clown - saw £103 stolen from his business at the Cresset. Mr Stancombe has run the soft playcentre for many years, and often has more than 100 children using the centre in a day. The distraction theft came during the school Easter holidays, when the soft play centre run by Dave was at its busiest. An envelope was taken from a desk at about 1pm on Tuesday, March 31. A second envelope, containing £25, was not taken. 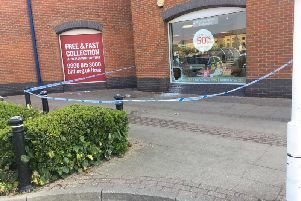 Monica Pickstone (70) who was cashing up when the theft happened, said: “It was about 1pm, and I had put the money in envelopes, when a woman and her two children came to ask about booking a party. I had put the envelopes under a book on the desk, and turned round to get the diary. “Another woman came and said she had lost her phone. “When I turned round, the first woman said she did not want the party. “Everyone had left when I realised the money had been taken. “I was devastated. I don’t know who took it, but I was only turned away for a matter of seconds. “Nothing like this has ever happened before. I have worked here for nine years. I can’t believe someone would do something like this. “It is the children who will suffer as a result of this. “I’m so hurt that something like this would happen. I have been struggling to sleep because of it. I still haven’t got over what happened. “I have also become very paranoid - all the money we get now gets put straight in the safe. Mr Stancombe said he was devastated by the theft. He said: “We have had a bit of trouble in the past, but not for many years. “The Tuesday was the best day we had had, so it is doubly disappointing to see this happen. I am very upset that someone would do this. “Monica is devastated - she was shaking like a leaf when it had happened. “We have quite a few regular customers, and they are all furious that someone would do something like this. Anyone with information about the theft is asked to call Cambridgeshire police on 101, or Crimestoppers, anonymously, on 0800 555 111.